Easter is a Christian festival celebrating the resurrection of Jesus Christ. Easter has no fixed date each year as it is determined by the Lunar calendar which is based on the phases of the moon. It is held on the first Sunday after the first full moon after the Spring Equinox and always falls between 22 March and 25 April. This year Easter Sunday falls on April 1st. Easter commemorates and celebrates the resurrection of Jesus after his crucifixion. Christians believe that Maundy Thursday, which is the day before Good Friday, marks the day of the ‘Last Supper’ Jesus had with his 12 disciples before he was betrayed by Judas. He was crucified on the cross the next day, Good Friday, and rose again three days later on Easter Sunday. Easter is a time when Christians hold church services on Good Friday and Easter Sunday. In some countries Easter processions take place through the streets. Passion plays are sometimes performed telling the Easter story. Many of the symbols we associate with Easter originate from Pagan beliefs around fertility, new life and new beginnings. Christians later adopted these new life symbols to remember the resurrection and their new life through Jesus. Lambs, bunnies, chicks and eggs are all associated with Easter and represent signs of Spring and new life. Many children believe the Easter Bunny visits at Easter and hides Easter eggs in their homes or gardens. Nowadays many visitor attractions hold Easter egg hunts and children can search for clues to win a chocolate egg at the end. In Russia, jewelled Easter eggs were made famous by jeweller Peter Carl Fabergé. In 1885, Russian Tsar Alexander III wanted a special Easter gift to give his wife. Fabergé designed and made a golden egg with a surprise chicken inside. From then until 1917 Fabergé made eggs every year for Tsar Alexander to give to his wife and from 1895 for Tsar Nicholas II to give to his wife and mother. A total of 50 Imperial Eggs were made and each one was beautifully designed and intricately made, always with a surprise inside. The Fabergé eggs which still exist today are worth millions of pounds. Apart from an abundance of chocolate eggs and treats some other foods popular at Easter include roast lamb, a traditional Easter Sunday lunch, and hot cross buns. The cross on top of these spicy bread buns represents the cross on which Jesus was crucified. Make chocolate crispie nests – melt some chocolate, mix in rice crispies or broken up shredded wheat until the cereal is covered, spoon into cupcake cases, make a shallow well in the middle and top with mini chocolate eggs. Leave to set and enjoy! Download our free Easter teaching printable and enjoy a decorate your own Easter Egg colouring template. See our blog post for more ideas of Easter activities. 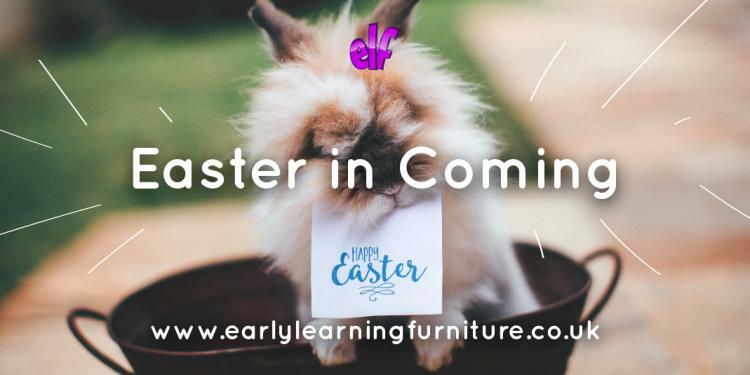 At Early Learning Furniture we supply furniture and resources for early years’ education. We offer a wide range of products including classroom furniture, school play equipment and school library furniture. For more information please contact us or call 01733 511121.